A 2007 Camry driven by Karen Lewis, 38, of Houlton was forced off the road Monday evening when it was struck by another vehicle on the northbound lane of Interstate 95 near Smyrna. 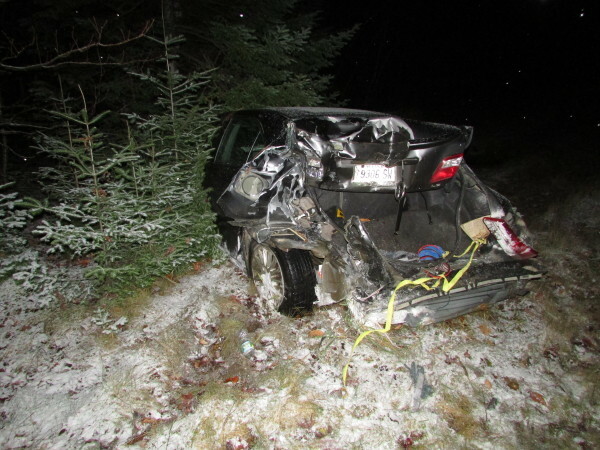 That vehicle did not stop and Maine State Police are searching for that operator. HOULTON, Maine — A Galveston, Texas, man was summoned on several charges Tuesday after he allegedly left the scene of an accident the night before that sent a Smyrna woman to the hospital. Aulton Fiegel, 28, was charged with leaving the scene of a personal injury accident, driving to endanger and operating after suspension after he was found at a local motel several hours after the accident, Cpl. Chuck Michaud of the Maine State Police said Tuesday afternoon. Karen Lewis, 38, of Houlton had been traveling north on Interstate 95 near Smyrna at about 8 p.m. Monday when her 2007 Toyota Camry was struck from behind by an unknown vehicle, according to an earlier news release from the state police. The impact sent Lewis’ car off the road, where it struck several trees before coming to a stop. The rear end of Lewis’ Camry was crushed by the force of the impact with the other vehicle, which Lewis told police slammed into her car and kept going. Lewis, who had been wearing a seatbelt, was brought to Houlton Regional Hospital by Houlton Ambulance with injuries not considered life-threatening, police said. Michaud said early Tuesday afternoon that tips from the public did lead investigators to Fiegel, whose 2016 Ford F-350, which had significant front end damage, was located at a local garage. The corporal did not know if Fiegel had driven the truck all the way to Maine from Texas or what he was doing in the area. Fiegel is scheduled to appear in Houlton District Court on Jan. 17. Michaud said he was wearing in a seatbelt and was not injured in the crash.